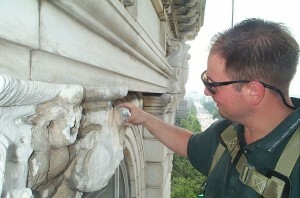 As a compliment to our other services, FEA offers historic preservation and restoration consulting. In all eventuality, building repair or restoration services are needed at buildings and facilities of historical significance. This presents unique challenges in repair as a given project may include aspects of historical preservation, rehabilitation, restoration, or reconstruction. Buildings and sites on the National Register of Historical Places are subject to additional regulations and special guidelines as dictated by The Secretary of the Interior’s Standards for the Treatment of Historic Properties. (link – learn more about these terms) FEA can work with owners and property managers in preserving, rehabilitating, restoring, or reconstruction their historic properties. Careful and knowledgeable selection of materials and techniques is paramount in maintaining the historic character of a property while ensuring reliable and long-lasting repair solutions. FEA can assist in all stages of historic restoration work including historic evaluation and assessment, design of repairs, project permitting with regulatory agencies, reputable contractor selection, and construction monitoring.